Our estate is situated on the slopes of Mt. Hualalai on the Big Island of Hawaii. We are located just 15 minutes from the Kona Airport, 10 minutes from the quaint coastal town of Kailua-Kona, 10 minutes from the artists’ village of Holualoa, and also 10 minutes from Costco! We are at a comfortable 1500' elevation and have over 100 producing Kona Coffee trees that we will give you samples of to enjoy during your stay. 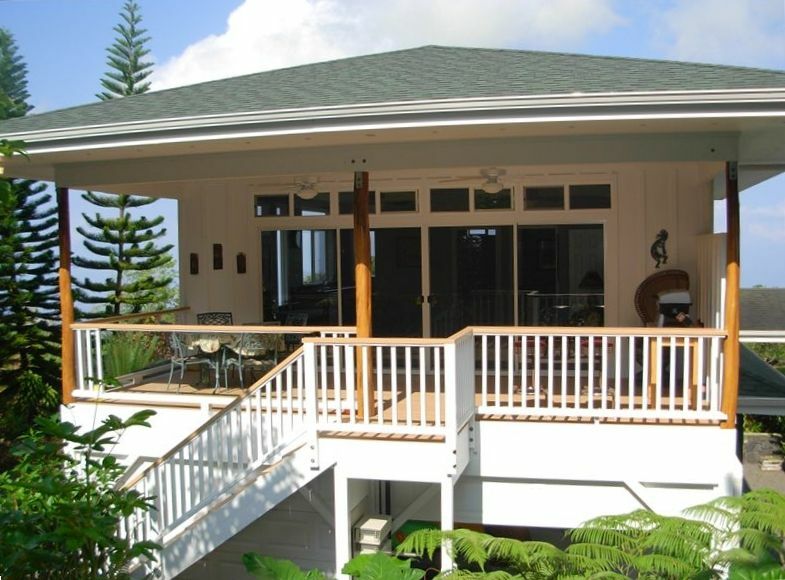 Separate from the main house on the estate and above the garage, we offer a private, peaceful, Hawaiian motif 1 bedroom/1 bathroom apartment with fully equipped kitchen with granite countertops, and bamboo floors throughout. There is a 42” flat screen HDTV with multiple channels, free wireless high speed Internet , stereo, CD & DVD player. There is a queen bed in the bedroom, and a Euro lounge sofa/bed that converts into a 46' x 78' bed (almost full size) in living room, with all linens supplied. The bathroom has a large walk-in tiled shower with plenty of bath and beach towels supplied for your use. The bedroom and kitchen have views overlooking the ocean. The large sunny living room extends onto your large private lanai through 16' sliding glass doors overlooking the lush gardens & greenbelt. There is a gas BBQ, and table and chairs on the lanai. Watch the native birds and the occasional wild pigs stroll by! The unit is perfect for 1 couple +, maximum 4 persons (check convertible bed size), but not suitable for small children. Overall square footage, including lanai is 816 sq. ft. It is not handicap accessible as there are stairs up to the apartment. You are also welcome to enjoy your morning coffee or evening cocktails in the gazebo overlooking the estate and Pacific Ocean. There are coin-op laundry facilities available for your use in the apartment. Beach chairs, cooler, and umbrella are also available for your use. Kailua-Kona has several world renowned events, including the Ironman Triathlon in October, and the International Billfishing Tournament in August, along with ongoing outdoor athletic events. There is lots to do on the Big Island. You can fish, surf, snorkel, scuba dive, kayak, swim with the dolphins, golf, see an active volcano, hike, bike, and star gaze at an observatory. This accommodation is an extension of our estate’s pride of ownership. We want you to make yourselves at home and treat it with the respect you would your own home. Hawaii Transient Accomodation Tax ID #038-326-4768-01. We moved from California to the Big Island of Hawaii in 1986. We love the slower paced island lifestyle, weather, and water activities. We have traveled extensively and would love to share what we think is one of the most beautiful places in the world with you. Having lived at various other locations on the Kona Coast since 1986, we found our dream property in 1999, and call it 'our final resting place'. Our 1 acre coffee estate is situated at a perfect elevation, which offers a bit cooler temperature than at sea level. It is in a rural, quieter area, yet still just minutes away from town and the beach. On site owners/managers, private, peaceful, with all the comforts of home. Bird watching right from your own private lanai! Walk-in tiled shower with tiled bench. Approximately 3 miles from the ocean. Rural, yet, just 10 minutes from town. Kailua-Kona, and Holualoa Villages, both 10 minutes away via car. Free standing, efficient electric heater in living room. Various spices, sugar, other sweeteners, oil, vinegar and other sauces. Outdoor dining on the lanai. Apartment overlooks green belt and garden area. Ocean view from kitchen and bedroom. Beach towels, chairs, umbrella, ice chest available. This vacation apartment is exacting as pictured and described in its posting. It is welcoming and is decorated with Hawaiian themed items and art providing a very relaxing atmosphere. The owners thought of everything a guest might need. On arrival the owners even supplied cold drinks in the refrigerator. The kitchen has all the cooking/eating utensils you would want. We were also very thankful for the beach towels, beach chairs, a cooler and drying rack. We enjoyed their home grown coffee each morning with the view of the ocean and lush landscape. We had a wonderful time exploring the Big Island throughout the day and then driving back to this beautiful apartment with it lush gardens to relax and rest. Thank you Donna and Robbie for a great time! This is a very nice place to stay. A large and roomy unit, at least for two people. A nice Westerly view of the Ocean and the sunsets. It is also a very quiet place. One could hear a few birds and other creatures but that is about it. Did not hear any road traffic as the unit is a good 200 yards or more from the road and there never seemed to be much traffic at night. The unit is well equipped and we did not lack anything. It was also interesting to be staying where the owners grow coffee. The unit is at about 1500 feet elevation so it cools off during the evening and is very nice for sleeping. It is very handy to get places from this unit. Yes, you do have to drive down the hill to get to the beaches; but, it does not take long and you take one road if you are heading South and another if you are heading North. Also if you go straight down the hill you hit Costco. We would definitely stay here again if we were in the Kona area. Cabin was immaculate, and just the right size for two. Lots of sunlight, lots of fresh mountain air,( never slept so good! ), with great views! The lush greenery was beautiful to my winter weary eyes! To only negative was that being just off the busy Mamalahoa road dictated that we had to climb into the car to get our daily walk in! Our host were generous with their time toward us, and were helpful in our day to day planning.We loved the Big Island! We really loved this condo. If you want the nature experience Hawaii offers, this is the place. Beautiful views and landscaping. Birds singing, flowers blooming, well maintained unit! Loved it. The guest house was as advertised. Spotlessly clean and well appointed. The views from the cottage are limited but guests have use of the gazebo for panoramic sunsets. The higher elevation gives cool nights for great sleeping weather. A great experience in the coffee belt and still only a short ride to the center of Kona. We’re glad you and your sisters enjoyed your stay, and hope you can come back again! Active volcano viewing, star gazing. Not handicap accessible. Not suitable for small children. Rates subject to change until booked.